Brick Pavers Jacksonville: Four Reasons To Commit To Brick Pavers Now! Are you tired of looking at your old, cracked concrete? Consider making the switch to brick pavers in the new year. Our landscaping experts can install gorgeous brick pavers in a variety of colors, shapes, and sizes to create beautiful walkways, driveways, and patios. This is a good option for residential landscaping, as well as commercial landscaping to add some aesthetic appeal to your property. 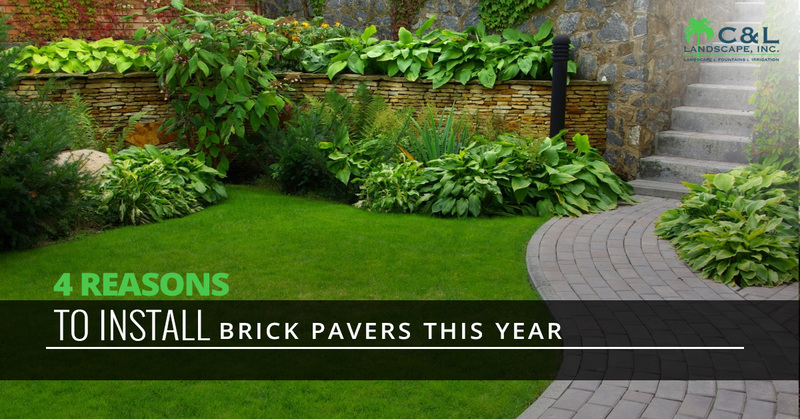 Keep reading to find out four good reasons to install brick pavers in 2018. Want Beautiful Brick Pavers? Give Us A Call For A Free Consultation! Concrete is the most common material used for walkways, driveways, and patios because it is cheap to install and initially looks really good. However, concrete can crack, split, and stain with time, leaving it looking more like an eyesore than a beautiful place to walk. As the soil beneath concrete or pavers shifts and settles, cracks are inevitable – especially with large brick paver slabs. However, quality pavers are accepted to three or four times stronger than poured concrete and take a lot more force to crack. If a slab of concrete cracks, you either have to live with it or replace the entire slab. And like we said above, concrete can stain. While pavers can stain occasionally, they are much more resistant to things like grease and oil stains than concrete is. If there is a problem with the pavers, such as an uneven stone or a cracked brick, it is very easy to fix just that one stone. Even if a tree root is causing the ground beneath the pavers to push up, that section of pavers can be removed, the root can be cut, and the pavers can be reinstalled all in a couple of hours. Brick pavers also require almost no maintenance other than occasional sweeping or hosing down. Drainage is especially important with the weather we have in Florida. Pooled water can attract mosquitos and grow bacteria. Brick pavers allow for water to seep through between each stone, meaning water won’t settle on them or create excess runoff. This is also beneficial if you have a pool or young kids running around, as concrete can become slippery when wet. Poured concrete needs time to cure, and often requires specific weather conditions to cure properly. Additionally, while you can usually walk across concrete 48 hours after it is poured, it really shouldn’t be exposed to heavy machinery such as cars for a whole month while it completely cures. Brick pavers can be walked and driven on, in most cases, the same day they are installed. We didn’t mean to completely rag on concrete. There is a time and a place for poured concrete – we just want our Jacksonville residents to consider all the options. Get a free consultation today to find out how brick pavers can improve your property.